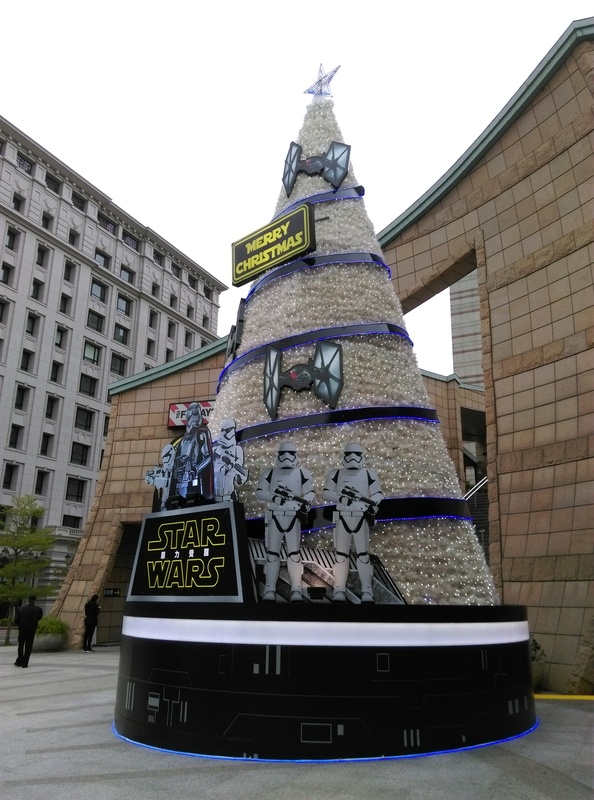 Christmas is one day away, so enjoy a photo of a very “Imperial” Christmas tree in Taipei, and a book review. Merry Christmas everyone. In Grounded – A Down to Earth Journey Around the World, a couple circumnavigate the world by train, bus and ship, without ever going on a plane. They do this because, according to author Seth Stevenson in the detailed intro: “We despise planes and all they stand for,” (we being him and his girlfriend). As a result, starting from the US, they cross the Atlantic in a container cargo ship, take the Trans-Siberian train from Moscow to Siberia, go from Japan to China through SE Asia to Australia by ferry, bike, and train, cross the Pacific on a luxury cruise liner, then go across the US by train to where they started from. The journey sounds like an ordeal but Stevenson pulls it off rather smoothly, despite relying on desperate last-minute luck a couple of times. The writer makes it sound so easy, so much that the main challenge is often pure boredom such as when they cross the Atlantic in a cargo ship and encounter a week of mostly unchanging scenery. One drawback about such a journey is that they often stay in major cities for very short times, sometimes leaving on the same day that they’ve arrived. I know sometimes people say it’s more about the journey than the destination, and Stevenson emphasizes this as well, but I’d rather read more about Moscow and Helsinki than just a page or two. Stevenson does admit this problem later in the book, wishing that he could see more of Sydney for instance. Similarly, the two cross Japan and China in a blur. The book breezes by and before you know it, they are back to the USA. Coincidentally, the most interesting part is also the longest time they spend in a country, when they take part in a biking tour that cycles across Vietnam in 2 weeks. It is the only time they travel with other people in a group and the group dynamics and camaraderie turn out to be quite positive, though not with a judgmental overview about the tour guide at the end that was a bit harsh. There’s a lot of complaining during the trip, as you’d expect when trips involve overnight train rides on hard seats and dodgy freighters and crossing the Pacific by ship. Stevenson also doesn’t hesitate to be candid about his fellow passengers and is downright insulting about rural mainlanders visiting Beijing. Stevenson’s girlfriend Rebecca is a peripheral character throughout the trip but steadily reliable, and one can think he was lucky to have someone like her. Rebecca is so steadfast that even after Stevenson leaves her behind in Singapore to run onto a ferry going to Australia, Rebecca “bears no ill will,” Stevenson assures us, and she flies to Bali to rejoin him on the ship. Having first mentioned it in the beginning, Stevenson further reiterates his disdain toward flying and stresses how doing that robs travelers of a connection to the world. He explains how the ease of flying has taken the charm out of travel and led to the demise of ocean liners and trains, at least in the US. He is right on some counts, as air travel has actually become a less luxurious experience (mainly for us plebs who fly economy class) than the past despite becoming more common, such as cramped seat space, long pre-boarding security checks and mediocre food. But the accounts of his ferry and liner trips in this book do not make those modes of transportation sound any more attractive. Props to the author for crossing the Atlantic and Pacific by boat but I feel no desire to do it myself especially after reading how his experiences were. But weirdly enough, despite all these issues, I enjoyed the book and I found myself wishing that it could have been longer. Regarding the Ukraine, which has become a showdown between the West and Russia and where tensions haven’t improved after the Crimea formally seceded to become part of Russia, an agreement has just been reached between the EU, US, Russia and Ukraine. Whether it holds remains to be seen, but for a long time tensions have been getting worse since violence has spread to other parts of the country. Armed men have taken over government buildings in cities in Eastern Ukraine, the Russian-speaking part of the country that has stronger ties with Russia, demanding increased autonomy or even seceding like the Crimea to join with Russia. Ukraine has launched operations to retake the buildings, but their troops have “defected” and vehicles have been captured by pro-Russian militias. It’s a sign that there are many Ukrainians, in the eastern Russian-speaking parts, which don’t support the new government in Kiev or its Western-oriented views. It’s a very tricky situation, with Russia still keeping tens of thousands of troops just outside of Ukraine’s eastern borders, while the US has issued warnings, making vague pronouncements about taking increased action. The EU seems toothless and uncertain. To me, the troubles in the Ukraine raise two questions- the integrity of democracy, and the validity of Western media coverage, especially American. I couldn’t help thinking that all this stems from a basic issue- the overthrow of a democratically-elected leader through unconstitutional procedures, which was basically a mass protest movement, one that was pro-West and supported by the West. I understand the previous president Victor Yanukovych, had angered millions of Ukrainians by refusing to sign a deal with the EU. But does this justify overthrowing a leader because he did something a lot of people don’t agree with? Especially if there were probably millions who may have agreed with it, or at the least did not have a problem with it. I am not supporting Russia or the confrontational stance of its leader Vladimir Putin, nor am I ignorant of the possibility Russia is heavily involved with the tensions. However, the main point is if the protesters in Kiev got their wish in causing Yanukovych to flee. If this leads to civil war and the breakup of the country, will the protesters believe it was worth it? This increasingly turbulent state of affairs in Eastern Ukraine reveals the deep chasm in the country, between the more pro-West capital Kiev and the West and the pro-Russian East. It was something Western media seems to have overlooked during the protests in Kiev against the former leader, in portraying this image of a people who were completely against Russia and desperate to join the EU. That might have been true, but I’m sure there were many Ukrainians who didn’t agree and to which the media generally ignored. Instead there were media stories about the mass protesters in the center of Kiev, the Maidan, and their heroism, ideals and honest and noble dreams, in comparison to the backwards, oppressed and ignorant Russian speakers in the eastern part of Ukraine. At the same time, I admit that I trust Russian media much less than Western media, though that means the latter is held to much higher standards. Besides Ukraine, there have been recent popular protests in Egypt, Thailand and Taiwan against governments that were democratically elected. Claiming noble aims, the protests attracted huge numbers, favorable media coverage from the West, and had serious impact on their countries, even to the point of overthrowing leaders. Some people see this as people power and laud it, but I see a mockery of democracy, selfishness and chaos. It’s coming close to two weeks and the missing Malaysia Airlines plane is still missing. There’ve been more developments during this week, such as Malaysia announcing that the plane was definitely hijacked (which is just a theory despite what they said) and that it flew west from Malaysia, away from its intended flight path. The most recent development is an ongoing search for large pieces of debris that were spotted in the Indian Ocean west of Australia. The disappearance has been a big puzzle to much of the public and heartbreak for the families of the missing, not to mention a boon to the media and so-called experts and analysts. It’s also a sign that despite all the high-tech devices and the Internet and news and connectivity that we constantly surround ourselves with, it doesn’t mean beans at times. I also feel the same way about the situation in the Ukraine with Russia having basically annexed Crimea right in front of the world, and other crises in Venezuela and Syria. It feels weird and surreal to be able to read and watch so much news about a crisis as it’s happening and yet none of this has an effect on Russia, which has acted with such impunity. The US has responded with sanctions against Russia, which seems like a puny response but probably the most practical option given a military war isn’t appealing (at least to the West). I’d lauded the multilateral cooperation on the search as a positive thing, but the opposite seems to be true as well. The lack of competence, cooperation, and trust has aggravated regional and neighborly tensions. This is in spite of the fact that Malaysia and its neighbors are members of ASEAN, the longstanding Southeast Asian regional body. China, as a big nation and regional power, should be taking a major part in the search, as most of the missing passengers are Chinese, but then again, few of its neighbors truly trust China, and China doesn’t necessarily have the outright capability to send naval and air search so far out beyond its shores. It’s also unfortunately a sign that Asia isn’t quite the future power sphere that many folks in media, academic and political circles claim it is. Just came back on the weekend from a short holiday to find the world has become a bit more turbulent. On Sunday evening, China suffered a ghastly terrorist attack when alleged Uighur separatists attacked civilians in a train station, killing 29 and injuring about 130. This attack took place in Kunming, capital of Yunnan province, which is far from Xinjiang, and represents a disturbing escalation (assuming the perpetrators are indeed Uighur terrorists) in tensions involving Uighurs and the state, in terms of both the victims (innocent civilians), the place (train station) and the location (another province). The suddenness and the body count seems to have stunned the authorities and people enough that for now, there’s actually been some sort of reasonable approach to coping with the tragedy and a lack of calls for revenge or repression. Ukraine had been going through a crazy set of events where its Russia-leaning former president was forced from power by mass protests in the capital. Suddenly this was upstaged by an even crazier development where Russia decided enough was enough and sent in troops, supported by local pro-Russian militia, to seize government and military installations all across the Crimea, an autonomous coastal region which has a lot of Russian speakers and houses a Russian naval base. Besides occupying the Crimea, Russia might move on further into Ukraine, which will almost certainly trigger war with Ukraine, and by extension the US and maybe the European Union. In Beijing, no violence and turmoil, but the weather has been terrible lately, to the point where day after day seems to be apocalyptic gray and hazy from morning till evening and the PM2.5 reading (which measures the amount of polluted particles less than 2.5mm in the air that can get into your bloodstream) has soared to over 400. The weather has been bad before, in the past half-year I’ve been here, but only say one or a few days per week. For the past two weeks, it seems like it’s been continuous. This was one week ago and it hasn’t gotten much better.